Our programs take a holistic approach to providing theoretical and practical educational components of the gastronomy and hospitality industries. We convey foundational knowledge through teaching and dialogue. Additionally, we include extensive intercultural training to equip participants for excellence in their new professional environments. Our programs are characterized by the competences of our certified IHK trainers in the gastronomy sector –both in vocational training as well as in remedial instruction for aspiring professionals in this sector. Through applied practice and knowledge in tourism planning, nutrition sciences, intercultural culinary education, system catering and other related specialisation, our programs provide the best professional, personal and intercultural qualification for the participants. Professional Training: theoretical and practical classes in basic food and beverage handling, customer service, health and hygiene, intercultural skills, and other relevant topics. Mentoring: participants will receive guidance about working in the German gastronomy and hospitality industries as well as about work life in Germany through mentoring from industry professionals and Turning Tables staff. Mentoring support goes beyond the Step-IN program and into the first few months of the vocational training course. Practical Work Experience: Participants will undertake an internship with the companies that are considering hiring them as trainees. Onboarding preparation: workshops in CV writing, interview preparation, workshops on working structures, etiquette. Matching: During the program there will be opportunities for companies and participants to interact, in order to facilitate a successful matching at the end. Upon completion of the training course, participants will interview with our partner companies for apprenticeships to conclude the mutual selection process. Our goal at the end of each three-month training program is for every participant to be placed in an apprenticeship and for every industry partner to fill a vacancy with at least one program participant. The Step-IN Program includes a three-way approach to mentoring that aims to address all components of the professional training and integration experiences for both participants and partner companies. This helps ensure a smooth experience for everyone while allowing people with different areas of expertise and from different backgrounds to share their knowledge. Mentoring refugees-partner companies: We train selected mentors from partner companies, support with mentoring objectives and goals and facilitate weekly meetings between mentors and mentees from the start of the internship (2nd month of the program) into four months of the ausbildung program. Mentoring refugees- Turning Tables: Throughout the program Turning Tables focuses on tackling individual needs of our participants along with work and school counseling. 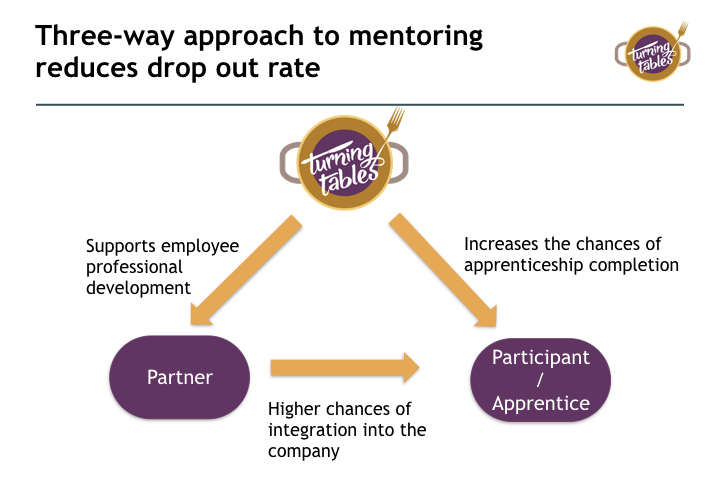 Mentoring Turning Tables – Partner companies: Turning Tables supports companies with any work-based queries arising from bringing on new workforce. Mentoring support goes beyond the Step-IN program and into the first few months of the vocational training course. Introductory Workshops provide a first insight into working in the fields of gastronomy and hospitality. During the course the participant acquires a set of skills and knowledge that helps them identify if they are interested to pursue a career in the gastronomy and hospitality sector. After completing the Introductory Workshop participants can apply to join the Step-IN program and further qualify for starting an apprenticeship. The courses combine lessons and practical work, so participants can immediately apply what they have learned.